"This keychain is just too cute for words. The design features an adorable kawaii styled tomato with big eyes and two little front teeth. 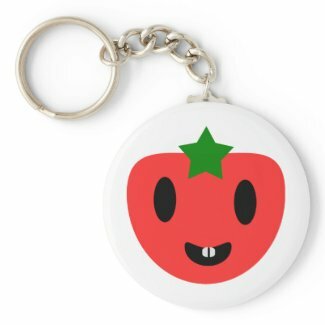 When printed, the tomato definitely has a brighter and more vibrant red color, the Zazzle preview washes it out a bit. There is a small glare on the keychain, but I think it captures the deeper red that was printed. The photo also shows some white specks, not really sure why it turned out like that. The keychain shows no signs of white specks or scratches. The printing was perfect. This design is suitable for children and even adults. Basically, anyone who enjoys cute things will love this design." -Jasmine W.
I too have noticed that many times Zazzle's items will look washed out in the image preview but when I order it and it arrives, it is fantastic and very true to color! Itaya Art - Me too! :) And yes, the printing on every product I've ever ordered has been nothing less than amazing.